Subscribe now to enjoy e-News and daily digests! If you are interested in keeping in touch with Lama Zopa Rinpoche’s activities and those of the world-wide FPMT family, we recommend that you subscribe to our e-News and FPMT Latest News daily digest. 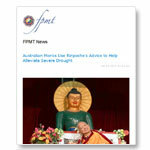 Subscribe to receive the monthly FPMT e-News to keep up to date on the latest news on Lama Zopa Rinpoche’s schedule and advice, new Dharma materials, FPMT centers, projects and services around the world, and opportunities to offer service; plus receive occasional emails providing the opportunity to support the Foundation. The Foundation Store e-News comes once a month informing readers about our specials, new practice items, and Dharma gifts. 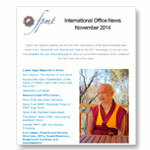 Receive a daily digest of the latest news about Lama Zopa Rinpoche, announcements from FPMT International Office, new Dharma education materials, updates about projects and services, and news of FPMT teachers. *You can choose to discontinue your subscription to the two FPMT e-News or other communications by clicking on the “Email Preferences” link which appears at the bottom of our communications. If you wish to opt out of all FPMT e-mail communications, you may select the “Opt-Out” link. Please note this does not apply to communications from cpmt@yahoogroups.com (which is restricted to key FPMT center personnel only), or from fpmt@yahoogroups.com. For these communications, please subscribe or unsubscribe through these yahoo addresses directly. If you have any further questions about your FPMT e-mail subscriptions, please send your inquiry to friends@fpmt.org.